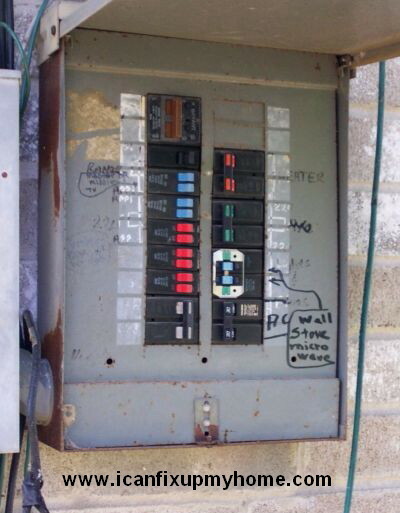 The homes circuit breaker box, also called the service panel, needs to have have clear labels that identify which of the homes electrical circuits are protected by which electrical fuse or circuit breaker. If the label isnt there or hasnt been filled out, its important for the homeowner to match rooms and outlets to circuit breakers or fuses and document the information on the label. Local electrical building codes may require this documentation, however electrical contractors sometimes fail to complete this task since building inspectors sometimes disregard this requirement before signing off on the building permit. But of course theres a more practical reason to map and label the homes electrical circuitry; this will make power troubleshooting and hard-wired appliance replacement less time intensive. While following circuit paths, logical results dont always result. This is especially common if the home is dated, is higher than one story, or if its seen a kitchen or bath remodeling project. To make the job easier, first draw a rough sketch of the home layout, outlets, and hard-wired appliances. When documenting the breaker box, dont do things like write Joe's bedroom. Instead, write something like East center bedroom, or whatever is appropriate for the residential layout. Also, when labeling the service panel, either directly on the metal or on paper that goes in a plastic sleeve, use a Sharpee or some other brand of indelible marker. Its also a good idea to make a back-up copy. Before getting started, its a good idea to have a basic understanding of residential electrical circuits and how power makes its way through the home. Working a helper to trace electrical circuitry is the best way to go. Both cell phones and walkie-talkies are handy for communication. The first person should stay at the circuit breaker box while the second roams the home, both interior and exterior. The second person tells the first when to trip the circuit breakers and which rooms, outlets, landscape lighting, or appliances are affected. Turn off all circuit breakers except one. Take note the location of the energized outlets, appliances, ceiling fans, lights, etc. Outlets or receptacles can be tested with a voltage tester, digital or analog multimeter, lamps, or a portable radio. Repeat procedure with the remaining circuit breakers. A circuit finder can be a lifesaver for a hard to diagnose outlet. First, a remote probe is plugged into the outlet in question. Next, the circuit finder is passed slowly over the bank of circuit breakers. As soon as the finder lights up, thats the right breaker. A circuit finder really shines as a time-saver when the outlet is on another floor. Sometimes, especially when adding electrical outlets during a kitchen or bathroom remodeling project, outlets are connected to existing circuits based on load rather than convenience. Good examples of low voltage circuits are doorbells and non-battery operated thermostats. Try ringing the doorbell to identify it and turn the thermostat up or down until the central air conditioner, swamp cooler (evaporative cooler), or central heater kicks in.